Since I really enjoy reading other people’s favourites lists, I thought I would start my own and post some here on the blog or in my newsletter now and then. I find I discover new blogs, recipes, books and podcasts through other bloggers lists, or through similar round ups on podcasts, so I hope you can find the same here! This new blog post from Beth Kirby of Local Milk - I love Beth’s honesty, and acceptance around the fluidity of her blog and it’s changing focuses over time, and her talk of slow living as “deciding what really matters to you and saying no to everything else”. This Carrot Cake from My Name is Yeh - I made this (sans tahini) for my Dad’s birthday last month. It is now my favourite carrot cake, as the combination of the hawaij spices, carrot and caramel were just perfect! A Bookish Baker’s blog post on why she is no longer niching her blog - In all the noise around monetising blogs, being an expert on one thing and there only being one path to follow for all this to be successful, sentiment such as that expressed in this post are so welcome and necessary. Courage & Spice Podcast: The Podcast for Humans with Self-Doubt - This is a fairly new podcast from Sas Petherick, who has done extensive research on self-doubt. I am loving hearing Sas’ advice and interviews so far, they often feel like they are great personal pep talks letting me know that self doubt isn’t just something I experience, and there are things I can do to alleviate these feelings and start to boost my confidence. 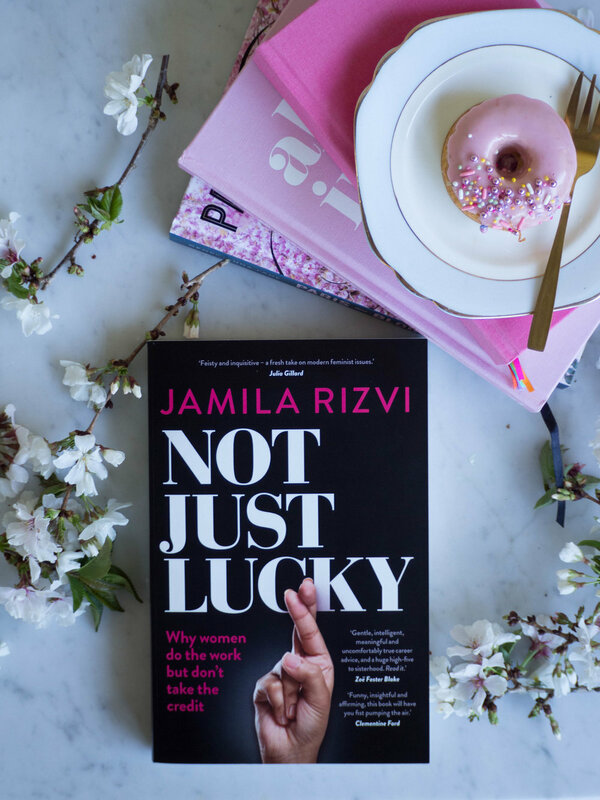 ‘Not Just Lucky’ by Jamila Rizvi - I can’t stop recommending this book (sorry to those who have already heard my insistent arguments on why they should read it!). If you are female you will probably be able to relate to this book. Jamila focuses on women and the work environment, and I can honestly say I related to so much more than I ever thought I would. There were so many moments where I thought, ‘Oh other women feel this way too?’, ‘I’m not the only one?’, and ‘OMG it’s like Jamila knows me’. It’s good to know you aren’t alone in how you feel, particularly in the work environment, and Jamila gives some great advice on how to deal with the gender inequalities that plague our workplaces. But now on to the doughnuts (or donuts? 🤔I never know which). They are extremely simple to make - they take about 10 minutes to cook, which makes them not only slightly healthier than the traditional fried doughnuts but also much quicker to make. To intensify the vanilla flavour a little, you could use some vanilla sugar instead of the white sugar. I used blood orange juice in the icing, because I love the colour, and I still have lots of blood orange juice frozen from last season! 2 tbsp blood orange juice, approx. Preheat oven to 180 degrees Celsius, and spray a 12 hole doughnut pan with canola oil spray. In a medium bowl whisk together the flour, baking powder, bicarb soda and sugar. If your bicarb soda is a bit lumpy, sift to remove the lumps - there’s nothing worse than biting into a baked good to find a lump of baking soda in there! In a jug, whisk together the milk, yoghurt and the egg. Ensure the egg has been fully mixed into the other ingredients. Add the melted margarine and the vanilla bean paste and whisk until combined. Pour this into the flour mixture and mix until just combined - don’t over mix. Similar to muffins, these will toughen up if over mixed. Place a medium/large piping bag or zip-lock bag over a large glass to it is easy to fill. Spoon in the batter, then pipe into the donut pan, ensuring you only fill each about three quarters the way up - there is plenty of raising agent in the batter so they will rise and expand, and if each doughnut is overfilled the hole in the centre will disappear! Bake for about 10 minutes, or until the doughnuts are slightly golden and spring back to the touch. Allow the doughnuts to cool in the tin for a few minutes, then transfer to a cooling rack, using a small icing spatula to gently prise the out if necessary (don’t use a knife as you may scratch your tin in the process). Once the doughnuts have cooled, make the icing by mixing the 200g of the icing sugar and 1 tbsp of the blood orange juice together. If the icing is too runny add more icing sugar, if it is too dry add a little more blood orange juice. You don’t want to the icing to be very runny or it will all run off the donuts, and take any decoration with it! To ice the doughnuts, dip the top side of each (the side that was facing down in doughnut pan), into the icing and twist to ensure it is evenly coated. Remove and allow any excess icing to drip off. Leave each doughnut to sit with the icing on for a minute or two, then decorate with the sprinkles etc. Reference: ‘Sally’s Baking Addiction’ by Sally McKenney (Race Point Publishing, 2014), p.27. As soon as blood orange season arrived, I had recipe ideas swimming around in my head. I buy them about once a week, from the shops near where I work, only three or so at a time so they are easy to carry home after work. Then, come the weekend, I use some for baking things like this cake, then I juice the rest and freeze the it to use later on. My freezer is now quite full, along with the copious amounts of varying berries, homegrown mandarins and so much bread, the zip lock bags and small containers of blood orange juice are artfully placed in small gaps and spaces ready to be used once the weather gets warmer and ice blocks become necessary. The base recipe of this chiffon cake has been adapted from my favourite chiffon cake (of all time), the Custard Chiffon Cake which can be found in the Monday Morning Cooking Club’s first book. This chiffon cake was the first I ever tasted or made. Now it still remains my favourite, however adaptations such as this Blood Orange Chiffon are amazing and a great way to mix things up a bit and show off some lovely fresh produce. Not to mention I always love a cake with pink icing! Any excuse for pink icing!! 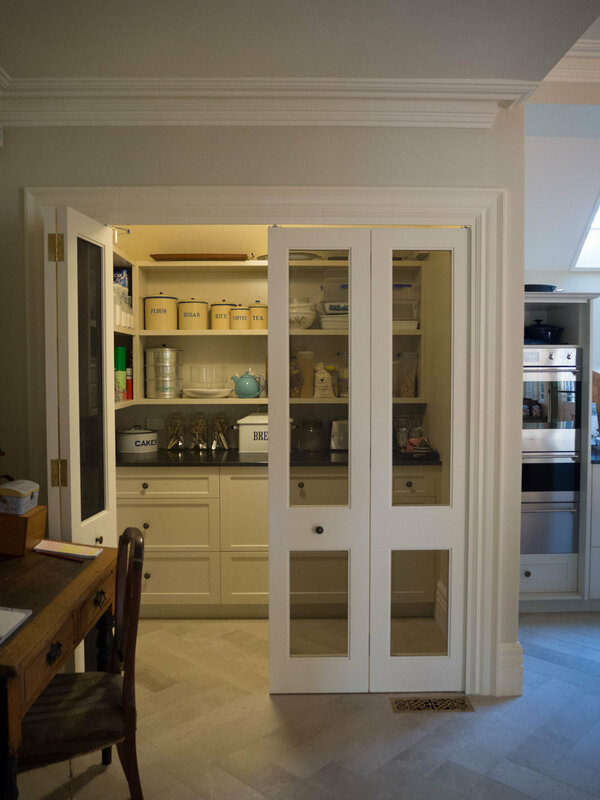 I have also added a few before and after photos of the kitchen to this post - just in case anyone was interested to see what I kept going on about for 4 months! As I mentioned in my last post, I am spending as much time as possible in the kitchen now, and am really enjoying being able to bake again. Making something like this Blood Orange Chiffon wasn’t at all possible for a while there, and I am so so happy it is all over and done with now! 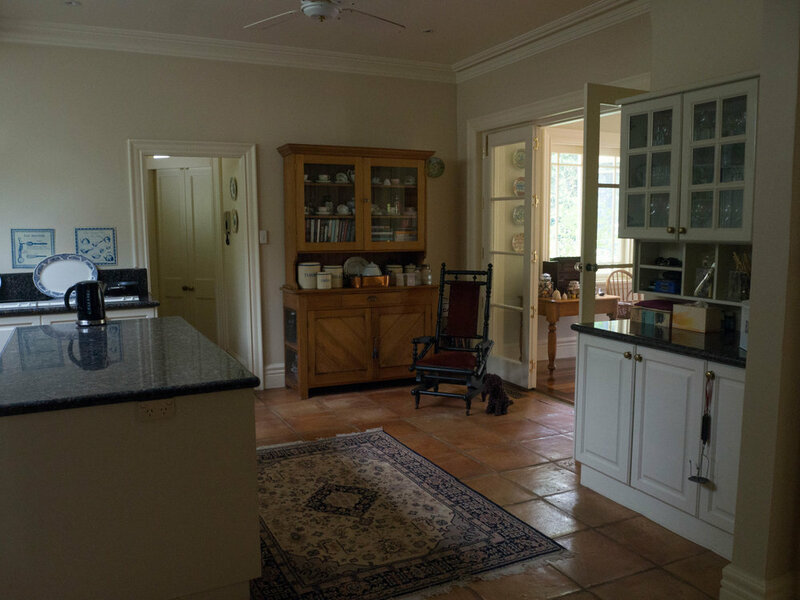 Click on the gallery below to check out the old kitchen vs the new kitchen! 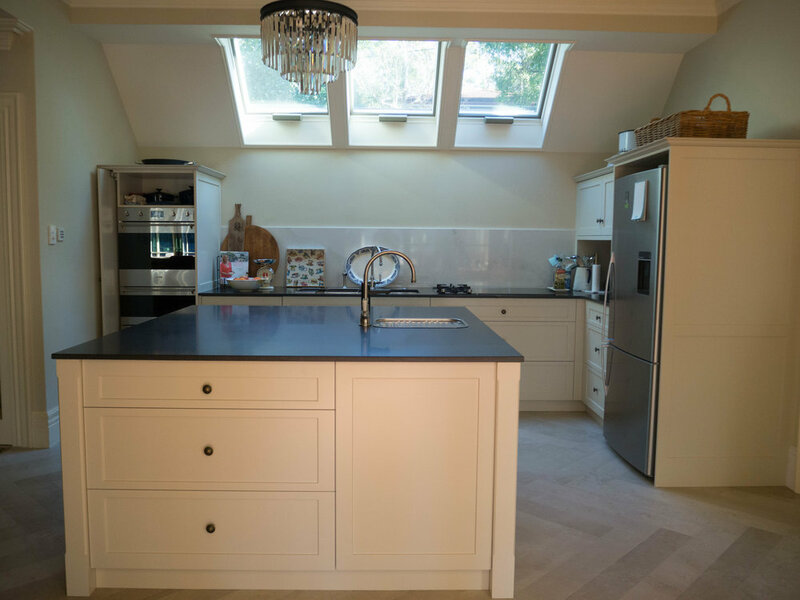 More detailed photos of the appliances and design features, as well as the laundry which was also renovated at the same time can be found here. Pre-heat oven to 180 degrees Celsius. Have an angel cake tin ready and nearby but do not grease it. The tin should not be a non-stick tin as the cake needs to cling to the sides of the tin as it cooks. Place rosemary into the oil, and leave to infuse. If you have time, leave it for as long as you can. Mix it about and squash into the oil to release some more flavour. In a small-medium bowl, sift the flours and cream of tartar three times. Using an electric mixer, beat the egg yolks with 1 cup of the sugar, until pale and creamy. If you have a free standing mixer with a paddle attachment, use this attachment for the egg yolks and save the whisk for later. Once pale and creamy, add the vanilla and blood orange zest. Remove the rosemary from the oil, and discard. Place the oil and blood orange juice in a jug and along with the sifted flour mixture, add to the yolk mixture while the mixer is beating on a low speed. Beat only until just combined. Using a separate bowl, whisk the egg whites using an electric mixer until soft peaks have formed. Add the remaining sugar, and whisk until the peaks are stiff (but not dry). Gently fold the egg yolk mixture into the egg whites with a metal spoon, a third at a time. Continue to gently fold until the mixtures are just combined. Do not over mix. Transfer the mixture to the cake tin and bake for 1 hour, or until a skewer inserted comes out clean. Immediately upon removing the cake from the oven you must invert the cake (stand it upside down). Using the hollow centre of the cake tin, place the cake upside down on the neck of a bottle and leave to cool. This process will stop the cake collapsing. This is also the reason for not greasing the tin, as you don’t want the cake to slide out at this stage. Once the cake is completely cool, use a small serrated knife to cut the cake out of the tin. Start with the outer sides then lift the cake out using the bottom of the pan. Then carefully cut the cake off the base of the tin. Carefully place cake on serving plate or cake stand. In a medium bowl, sift in the icing sugar. Gradually add the juice of 1 blood orange. Stir until well mixed and add more icing sugar if the mixture is too wet, or more blood orange juice if it is too dry. The consistency shouldn’t be too thick, as it should be able to run down the sides of the cake, and not weight the top of the cake down. Gently drizzle/spread the icing over the cake and arrange the rosemary sprigs around the top of the cake. When serving, cut the cake with a serrated knife. Reference: ‘The Monday Morning Cooking Club’ by Merelyn Frank Chalmers, Natanya Eskin, Lauren Fink, Lisa Goldberg, Paula Horwitz and Jacqui Israel (2011), p 35. Believe it or not, until recently I had never tried blood oranges before. I now know what I have been missing, and will be eagerly anticipating buying them when they are next in season. The first lot I bought were from the Pyrmont Growers Markets. The flesh was a deep purple and they were clearly at their prime. I have since bought more and each time I buy them their colour is lighter and lighter, more a pink-ish hue than the deep purple of the first ones. Their flavour is still great, and I have frozen a fair bit of the juice. I saw a recipe for a blood orange, peach and mango granita in Katie Quinn Davies first book, and will be making it as soon as Australian peaches are in season! The idea for this cake came to me after the first thing I baked with the first lot of blood oranges I bought didn’t work out so well. I found the recipe online and it combined the flavours of blood orange and coconut, and they just went together so well. Unfortunately the addition of blood orange juice in the recipe, just made the cakes very wet, soggy and unstable and they just fell apart. I then thought about trying another cake with these same flavours, and remembered a lime and coconut cake I made a little while ago (recipe here) that I thought I could adapt to suit the blood oranges. Luckily, this time it worked! While only using the zest in the cake reduces the punchy blood orange flavour a little, the blood orange icing mostly makes up for that (and the cake doesn’t fall apart!). I used some coconut blossom sugar in the recipe, just to try it and add to the coconut flavour of the cake, but it can be substituted for caster sugar. Also, if blood oranges aren’t available regular oranges could be used. This cake could also easily be made gluten free - try substituting the self raising flour for gluten free flour and baking powder. The quantity of flour in the cake is quite small, so as long as you don’t knock the air out of the egg whites when folding them into the batter, you should still get the same result. I used a lot of spring blooms when I styled the photos for this cake, and I really like the look they gave. The weekend I made this cake, I went looking around the garden for some flowers to use, and when I saw the weeping cherries we have, I just had to use them. 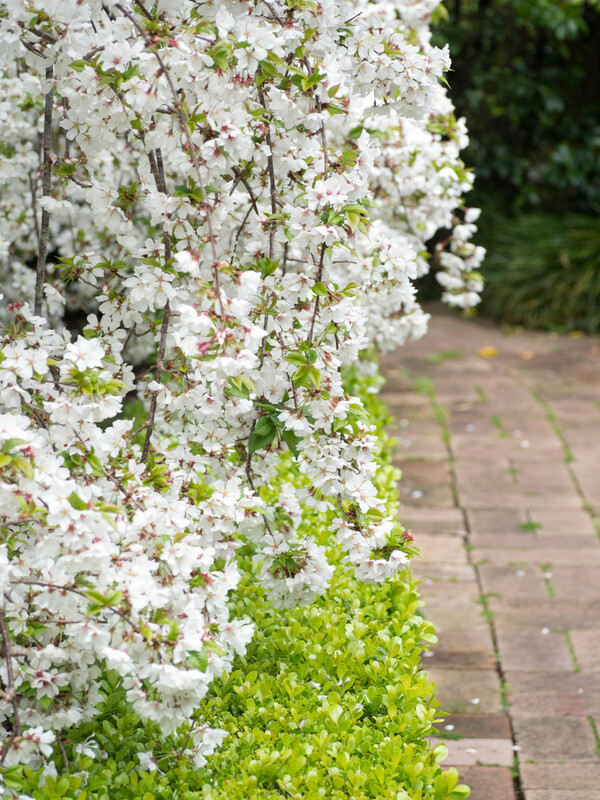 They had burst into bloom since I had last noticed them and were buzzing with lots of bees. Pre heat oven to 180 degrees Celsius and grease and line the base of a 23cm spring form cake tin. Beat the egg yolks and sugars in a bowl for about 3 minutes, or until they are pale and fluffy. Fold in the zest, coconut, flour and almond meal. In a separate bowl, whip the egg whites until stiff peaks form. Using a large metal spoon, gently fold the egg whites into the almond mixture, a third at a time. Pour the batter into the prepared tin and bake for 40 minutes, or until lightly golden and cooked through. Allow the cake to cool in the tin for 5 minutes, then transfer to a wire rack to cool completely. While the cake is cooling, toast the coconut chips in the oven for 2-3 minutes. Keep an eye on them as they will toast very quickly. To make the icing, sift the icing sugar into a bowl. Juice the blood orange, and pass the juice through a sieve to remove the pulp. Gradually add the juice (not necessarily all of it), until you have a smooth icing. Spread over the cooled cake and use the toasted coconut to decorate. Reference: ‘Bills Open Kitchen’ by Bill Granger (Murdoch Books, 2003), p.91.